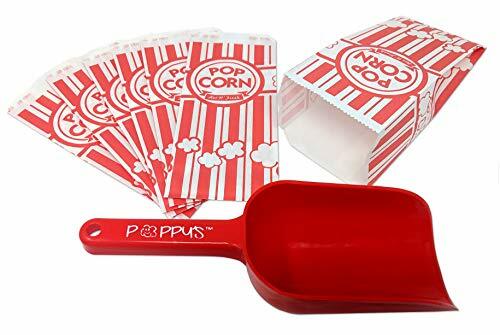 J Mark's Poppy's Carnival Popcorn Scoop is perfect for birthdays, parties, carnivals, school or church events, and more. The Poppy's Carnival Popcorn Scoop is specially designed to easily fill 1 or 2 ounce paper popcorn bags and buckets. This bundle included 50 1 ounce Carnival-themed popcorn bags. Be sure and wash with warm water and soap before and after each use. Avoid placing directly on any heat source. FUN - Poppy's Carnival themed popcorn Bags (50 count) and Scoop completes the carnival theme. The bright red 12 ounce scoop is perfect for birthdays, carnivals, school or church events, and more! PERFECT SIZE - Poppy's scoop was specially designed to fit perfectly inside 1 to 2 ounce paper popcorn bags and buckets. You're just a few scoops away from a day of fun! JUST RIGHT - 1 oz is the perfect amount of popcorn for any party. Bags can even be refilled, if needed. EASY TO USE - Efficiently fill popcorn bags in one to two scoops. J MARK GUARANTEE - As always, J Mark backs it's products with a lifetime, 100% money-back guarantee. Buy with confidence! If you have any questions about this product by Brand: J Mark, contact us by completing and submitting the form below. If you are looking for a specif part number, please include it with your message.